Finca Volvoreta is a small family producer fifteen minutes outside of Zamora, a charming town where the famous Duero River borders its walls, in the heart of Castilla y Leon. It was the first certified organic bodega in the entire region, let alone in the Toro DO., and continues to push environmental consciousness to inspirational heights. Antonio Alfonso grew up making wine with his father, and has now passed on the winemaking duties to his daughter Maria, who at that time was the youngest female winemaker in Spain's history. Now, the estate farms 15 hectares of vineyards (with many bio-dynamic practices) within their 100 hectares of organic property, in the highest elevation of sun-scorched hills in the region. It is a sublime land of forests, wild herbs, native insects and birds - all of which play an important roll in the gorgeous biodiversity of the area. Volvoreta means butterfly in the Gallego dialect of northwestern Spain, to pay tribute to the way all of nature must combine in order to create exceptional quality wines. This is a winery that has received a lot of press recently for their focus and dedication, as it is nothing short of spectacular to see the different wines coming out of this bodega. Volvoreta’s Flores de Cerezo is the winery’s youngest and freshest bottling from the property. This bottling comes from the younger vines of their organically and biodynamically grown Tempranillo (Tinta de Toro), on their estate vines that sit at about nearly 800 meters above sea level. The wine is fermented in stainless steel with only natural occurring yeasts, and is moved to used French oak for malolactic fermentation and a short aging before the wine is bottled and released to the market. The fruit from the property is noted for its ‘above average’ antioxidants, and is promoted by the major health clinics of Spanish Universities. This Toro shows bright and very expressive black and purple fruits, while still accentuating the earthy and gamey notes that are so prevalent in Maria’s wines. Meant for an easier and more accessible style of Toro, this wine is perfect for picnics, BBQs, or serious carnivore meals as well. TheVia Argentum from Finca Volvoreta is a small project designed to show the most fruit forward and bright expression of the intense Tinta de Toro grape. The vines are all hand harvested and the grapes are gently brought to the cellar for natural fermentation via carbonic maceration. The process begins in stainless steel vats but then is quickly moved to 720-liter clay amphora as well as old French barrique, both of which are kept in the family’s 400 year old, underground cellar. After several months of aging, the wine is bottled unfined and unfiltered with a bit of sulfur dioxide for the preservation of the fresh quality that set in while it aged. The result is full of dark black berry fruits, marmalade, violets, and minerals that unwind with hints of spice and citrus. The texture is lively and fresh, while remaining deep and fairly tannic due to the nature of the grape. Meant to be consumed within the first ten years of its life, versus needing ten years of aging to soften a bit. Volvoreta was the first single wine from their estate that holds the most significance for their history. Certified organic Tempranillo from their pre-phylloxera vines at 800meters above sea level, where some of the fruit stays in the vineyard to ferment in buried amphora with the natural yeasts from the field, while the other half is brought to the cellar to ferment in barrel. After 8 months, the wine came together and was bottled, showcasing beautiful character of land, fruit, and wood. This wine is noted for its ‘above average’ antioxidants, and is promoted by the major health clinics of Spanish Universities. From the glass, a powerful bouquet of ripe black fruits, minerals, and damp earth fill the glass while mingling with a fresh and subtle eucalyptus and mint aroma. The oak is subtle and very integrated with notes of balsamic, cocoa, and liquorices. On the palate, there is a soft, fleshy and sweet flavor that echoes the complex components found on the nose. ​Bodega L'Amphore is a small side project where Maria Alfonso, of Finca Volvoreta, has been working on aging some of her top Toro fruit in amphora for many years. The picturesque rustic vineyards are about twenty minutes outside of the town of Zamora, and were the first certified organic vineyards in the Toro D.O. The plot for this project is only about 4 hectares, and is the oldest group of fruit at the estate, where it sits within their 100 hectares of natural and gorgeous property high in the hills of the region. 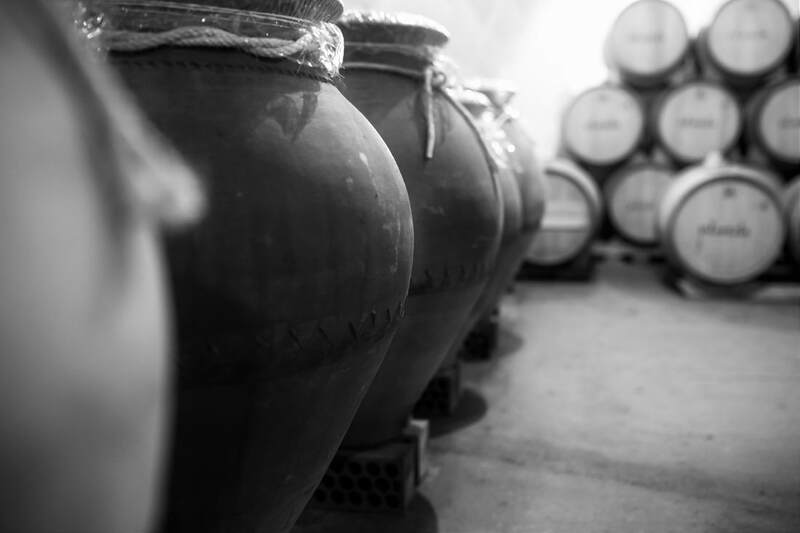 The production is less than 4,000 bottles and is already getting well-deserved attention for its long aging in amphora, its incredible finesse, and stunning story. This incredibly special wine is the second release from Bodega L’Amphore. With the 2006 first being released in 2017 after years of intricate aging, this estate only makes one wine, and it is a rare occurrence. The 2011 vintage was released in 2018 and saw a different elaboration than the previous bottling. Coming from Maria Alfonso’s oldest vineyard plot of about 4 hectares, the grapes are hand-sorted and gently pressed to begin a natural fermentation in new French barrique, where the wine rests for 12 months before continuing its journey. For this 2011 vintage there were just 2 220L amphora buried out in the vineyards that took on this incredible wine, where it aged for on more year. After another four years in bottle, Maria decided that the wine was ready to share with the world, showcasing the dark and feral tones of aged Tinta de Toro, while elegant and long on the palate.